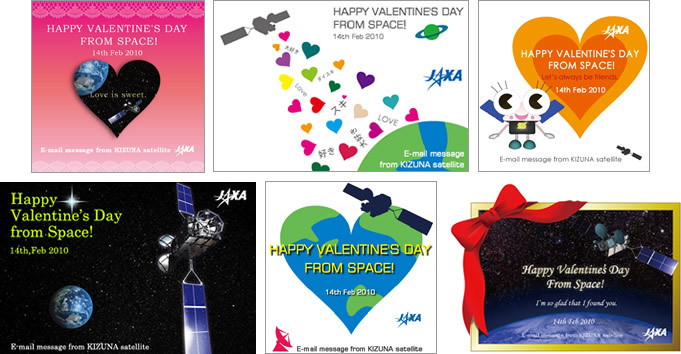 JAXA | St. Valentine's Day Mail Delivery from Space Using KIZUNA (WINDS) With Cutting-edge Technology "Cloud Computing"
Home > Press Release > St. Valentine's Day Mail Delivery from Space Using KIZUNA (WINDS) With Cutting-edge Technology "Cloud Computing"
With Cutting-edge Technology "Cloud Computing"
The Japan Aerospace Exploration Agency (JAXA) will hold a mail delivery event on February 14, 2010, St. Valentine's Day, to send your love message to your loved one from space through the Wideband InterNetworking engineering test and Demonstration Satellite "KIZUNA" (WINDS) in collaboration with the cutting-edge technology "cloud computing." This event called "Cutting edge technology - St. Valentine's day from Space" is one of KIZUNA's network application experiments. JAXA carried out mail delivery experiments using KIZUNA, and we received tens of thousands of registrations for sending mail each time. Based on the results of our past experiments, we will use a cloud computing system provided by SOFTBANK Telecom Corp, whose system is well known for its high flexibility, to connect KIZUNA and a ground network system in order to maximize the performance of KIZUNA's super high-speed and large-volume communications. JAXA is inviting you to join this experiment. We are looking forward to hearing from a lot of you to register your e-mail message. "Cutting edge technology - St. Valentine's Day from Space"
Why not make your St. Valentine's Day unique this year? 1) Please register mail address(es) of your loved one, friends, or family members, to whom you would like to send a love message. Both male and female senders are eligible. 2) The content of the message is fixed in order to prevent spam. You can select your illustration card from the choices on the website. 3) We prepare both English and Japanese versions. For English ones, please go to the English webpage. How to register: Please register from the following campaign sites. * Your name and e-mail address will be shown in the message. * You can register up to five people. Fixed message (Please understand that the message is subject to change. ): The following is a scheduled fixed message. In the case of sending a message to a mobile phone, the reference website address will be the JAXA Mobile website. This message is transmitted via the Wideband InterNetworking engineering test and Demonstration satellite "KIZUNA," which is flying in space about 36,000 Kms away from Earth. For more information about the "KIZUNA," please refer to the following page. This message is sent from a Send Only No Reply address. 1) This service is one of the KIZUNA basic experiments, thus please understand that there is a slight possibility of experiment failure. 2) Once your message passes through the KIZUNA, it will be delivered by a cloud computing system called the White Cloud" of SOFTBANK Telecom Corp. Messages will not be directly transmitted to individual personal computers or mobile phones from the KIZUNA. 3) JAXA will use your registered addresses only for this experiment. 4) A fee for receiving a message is not affected by the distance to the KIZUNA. System Structure: This event is based on the "WHITE CLOUD" of SOFTBANK Telecom Corp. and the KIZUNA satellite network. The network will be connected to broadband lines and a large volume of messages will be sent at the same time using a system built on the WHITE CLOUD*. Messages from registered senders via the Internet will be sent to registered receivers via the KIZUNA on February, 14, 2010, St. Valentine's Day. * This deliver system is developed by SOFTBANK Technology Corp. and HDE Inc.